← How to print PDF of saving an old newspaper? Question: I'm currently trying to apply for a job that requires you to upload a CV. I do not have MS Word, so I just use WordPad. The website only accepts documents in MSWORD or PDF format, whereas WordPad has saved it as a Rich Text Document and it won't accept it. I need to change the format without MS Word, but I have no idea how. Is there any solution on VeryPDF, please help? Answer: When you need to convert RTF to PDF, maybe you can have a free trial of this software: VeryPDF Document Converter. By this software, you can convert all the printable files to PDF including PDF. In the following part, I will show you how to use this software. Download Document Converter. There are many versions of this software stated on the website. 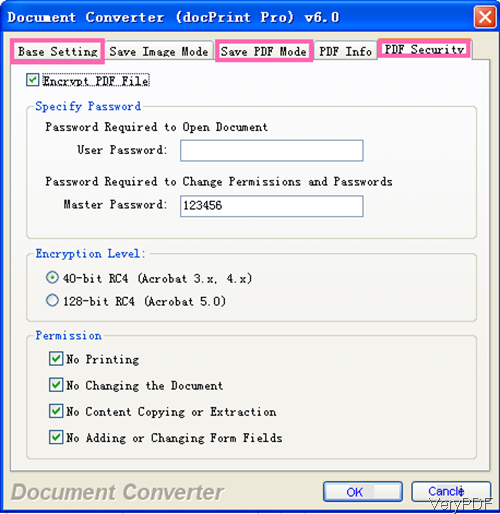 Please make sure download the Document Converter (docPrint Pro v6.0) version. When downloading finishes, there will be an exe in downloading folder then install it by double clicking the exe and follow installation message. When installation finishes, there will be an icon on the desktop. Please launch this software by double clicking the icon on the desktop. The following snapshot is from the software interface. Please drag all the RTF files needed converting to software interface then they will be listed with file type, file full path, file size and added date. If you do not set any limitations to the output PDF file, simply click button Start then the conversion will be launched at once. Meanwhile you will be reminded to choose the output folder. If you need to set password, add basic information or others, please click button Setting, then you will enter the setting menu option. The following snapshot is from one of the tab of setting menu, please have a check. In the Base Setting tab, you can set the output file formats as this software also can convert RTF to image. In the Save PDF Mode tab, you can choose how and where to save the output PDF file. In the PDF Info part, we can add basic information to PDF like title, keywords and others. In the PDF Security tab, we can set password to protect PDF in two levels from two aspects. By this software, you can change RTF to PDF for uploading your CV. During the using, if you have any question, please contact us as soon as possible. This entry was posted in docPrint Pro and tagged rtf to pdf. Bookmark the permalink.